1. The beginning movements are like a precursor of what is to come. It sets the stage for the dance steps. Playful and yet copying, the other. They movements are mimicking the doctor at first like in sync and then totally out of sync or syncopation. 2. It shows that they seem to be in agreement with the professor and then making fun of him. Being the straight man is an art, you can not break character. The students are bored and seem to know more than the professor. They become the teacher and the professor the student. 3. The professor is like an egghead and the students are modern and young know it alls. Playful with the professor and yet making the time interesting to them. O'Connor is like a class clown, yet trust worthy student and Kelly is the jock that everyone wants to be with. So the nerd for the professor, who wants everyone to learn and do well. The others are tired of the status quo and make this a fun time to play off each other. How﻿ do the pre-dance movements of O’Connor and Kelly compare to their actual dance movements﻿?﻿﻿ Gene was the “Alpha” male and Donald was the “Beta” male. Here, we could see they join together to sabotage the Professor’s diction lesson. Yes, they succeeds in it. All I could say is that Gene starts the show and Donald starts to follow. Watch﻿ th﻿e Professor all the wa﻿y through and conside﻿r the role of the straight man.﻿﻿ The Professor is a man with serious look. He is a no-nonsense man who doesn’t have the capability to digest practical jokes. Unfortunately, he becomes the “Jerk” of their mockery. How﻿ ﻿do the representations of masculinity in all three men compare and contrast with each﻿ other﻿?﻿﻿ Gene was the leading man who has complete control to portray any emotions. Donald was the supporting lead to Gene’s role and all he had to do was support him throughout the film through song and dance. The Professor was in a character role with serious approach, so he had only limited screen time in the film. They are very animated while they are talking before they start dancing. He starts off as their teacher, then becomes a prop that they move, then the audience to their dancing. The teacher is very prim and proper whereas the two guys are cutting up and having fun. All three are well dressed but Kelly and O'Connor are more casual type dress. Straight men are important in scenes like these because they cant break character or the will ruin thr scene. Their dance steps are synchronized, and both are mirroring one another. He is very serious while the others are ridiculing him by imitation, and throughout the dance with use of props which are thrown at him towards the end of the scene. They both seem to compete with one another but during dancing are mirroring one another. 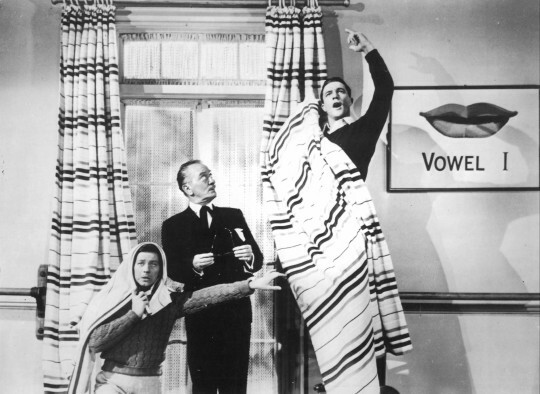 The professor doesn't seem to react to being ridiculed by the other two, and O'Connor was the more humorous character of the two. Kelly was more like the alpha male. Everything from eye movements that are in perfect rhythm, to head nods hand claps, shoulder shrugs and turn arounds…ALL are perfectly synchronized like the actual dance movements…add to the humor of the moment and prep us for the dance sequence. The professor has a quiet strength and gentle dignity. Kelly and O’Connor are exuberant and athletic. Their masculinity does not seem to be in competition in this clip. The pre-dance movements of Kelly and OConnor are rhythmic, fluid and synchronized. They begin repeating the tongue twisters rhythmically, drumming on the table, and step in rhythm together while playing off each other. It all plays directly into the transition to the musical number. As the straight man he becomes the contrast to the scene and further on in he scene becomes a prop. He remains straight faced and stiff through the entire dance scene from bending back on his desk to seated while given the “lesson” from Kelly and OConnor. And even as they trash his classroom, he remains the straight man. The professor plays the academic nerdy even “prissy” role. He is serious, and appears to be the weaker of the three. He is silly able to be manipulated and ridiculed, while used as the comedy relief for them. OConnor is the sidekick who is a goof off, class clown and disrupter who leads Kelly into participating in his playful mocking and disruption. He has the appearance of the weaker one as most sidekicks usually are cast. Kelly is the leading man strong and masculine, who isn’t completely sold on the whole vocal coach plan for the talkie transition, and as such he is easily able to join in the “fun”. As the scene progresses, he becomes the strong representative of Alpha male and OConnor becomes the less dominant male. The pre dance movements, while meant to be playful, were just as in synch as their actual dance. The scene needed the Professor as a Straight man so Kelly and O'Connor had someone to play off of. Kelly was the Alpha male, O'Conner was the beta male and the Professor was the straight man. The pre-dance movements have O’Connor and Kelly make gestures and action in sync in ways not a lot of normal people would move. They’re both walking to the beat and messing around with the professor with slight difference. O’Connor would be the Beta Male making faces and comedic timing while Kelly being his usual Alpha Male self would lead the way to cause mischief and calamity to up the boredom of the speech lessons. Their operatic singing blends in musically and up to the point where they are on the piano and bang on it with musicality until segueing to the actual dance movements where they’re on sync or showing off their solos for a brief time. He’s certainly a contrast to the two lively and non-apologetic singing and dancing men of their generation. He would be questioning like why are they suddenly dancing around, or living in a different world than our own reality where it isn’t impossible. He’s more stern and wants to go according to plan, yet whenever things go out of the norm, he would be confused and lost and gave in when O’Connor and Kelly make him a dummy. All men are at their own company helping each other out in their speech practices in male conformity. And they dress with suits and vest. Yet they contrast obviously as the professor is a straight man with grounded and logical thinking on how life should go for himself and others to expect to follow. O’Connor is the comic relief best friend to follow along with the Alpha male, Kelly. Kelly is the leader with strength, courage, and passion for life and entertaining others for joy. Their dancing is masculine in showing off their moves with athletic styles than a more sophisticated move common in the 1930s. 1. During their pre-dance moments and movements, it is quite apparent that Kelly's character is developing as the alpha male in the story. O'Connor is set up very early as the comic sidekick character. The dance that follows illustrates this. 2. The straight man in the clip, the professor, is the center of the trio. He is the teacher trying to control his class. O'Connor is the typical class clown. Kelly is at the head of the class and gets away with everything. 3. The professor in this clip is representative of the stayed, old-fashioned, conservative male character that our culture was moving away from and considering less attractive - comical. 1. Donald and Gene perform with their top part of their bodies. Using their hands and arms to express their feelings. Later on comes the actual dance with the talent of their legs. 2. The professor thinks he has them in his full attention. The react by copying what he's saying hence he thinks he's in charge but then they start imitating him with jest. He realizes that and then gives in as a straight man to their silly antics. 3. Gene seems to stay in character as a student willing to learn and shows he can be smarter than the teacher Donald shows off his 'class clown' abilities maybe because he realizes he won't be as smart as Gene and the professor tries to be the stern teacher and realizes he's not getting any where with his students. There is a natural fluidity to the way a dancer walks and moves. O'Connor, in particular, is great with his hands and uses them to great effect in his dialogue scenes. Sammy Davis Jr. once described watching another legend, Fred Astaire by saying (in essence), just watching Astaire walk into a room was worth the price of admission. Watching O'Connor and Kelly move, even without dancing, evokes the same spirit. While the frame is very staged for the audience, having the Professor in the shot (or just off frame) is vital to convey the humor throughout the piece. These characters are old buddies and seeing them joke around - and jerk around - the professor conveys their relationship while also being very funny. Kelly and O'Connor were two of the greats that danced like MEN! Sure, there are the touches of flair with an arm or a hip, but there is nothing effete about their moves or choreography. Kelley, in particular, is the alpha "jock." O'Connor is the beta "side-kick." Both trade-off making goofy faces and being silly, but each represents traditional masculine themes. The professor represents the stuffy, snooty old-world mannerisms and mores. This is appropriate as he contrasts well to the rough-and-tumble "American" attitude of the other two. The pre-dance sequence gets more and more fluid as it moves along. The fluidness of O'Connor's mimicking of the professor is like a choreographed dance between him and the professor and sets the stage for what is to come—a highly choreographed and syncopated tap of Cosmos and Don. 2. Watch the Professor all the way through and consider the role of the straight man. He seems to be very proud of his expert diction and with a little encouragement very easily slips into showing off rather than teaching until he catches a glimpse of Cosmo mimicking him. After that he goes from annoyed to completely overwhelmed by Don and Cosmos. It's always a plus to have a straight man for reactions. 3. How do the representations of masculinity in all three men compare and contrast with each other? All three of these are stereotypes: The professor is the intellectual—not much fun. Don is the masculine, hunky one while Cosmos is the sidekick—who often steals the show and in this case is nearly as athletic and skilled as the hunk.